Traditional Japanophiles enjoy partaking in the hanami cherry blossom festivities every spring, while pop-culture Japanophiles can’t get enough of the seemingly endless array of flavors that Kit Kat keeps rolling out here year-round. If you’re on a low budget or have to buy something at the last minute, stop by a convenience store or train station kiosk to pick up a 105 yen packet of sakura-themed Kit Kat balls. They don’t actually contain any flowers or leaves, but they come in seasonal pink and white colors with a cherry blossom printed on the package along with the slogan, “Kitto, sakura saku” (Sakura will surely bloom). The candy is meant to encourage school entrance exam-takers [Japan’s school year starts in April], as “Sakura have bloomed” is a standard expression for examination success. Those zany chocolatiers at Nestle have done something a little different this year, with a sakura-matcha flavor (cherry blossom and strong green tea) among their latest offerings. Other flavors currently listed on the Japan Kit-Kat site include maple, banana, caramel, plum soda, roasted sweet potato and even soy sauce. The full text of my sakura snack story can be found at the Singapore foodie website soshiok.com, which has added some information about restaurants in Singapore that serve sakura dishes. Here in Japan, I found the biggest variety of sakura snacks and drinks, including a pulpy and delicious amazake beverage, at Kaldi Coffee Farm, a chain of imported food shops that, like the veggie-rich buffets in my previous post , has seen its number of outlets grow along with the shopping mall boom of the past decade. According to Kaldi’s website, this year’s hanami-season product lineup includes sakura wine, sakura tea, sakura baum kuchen cake, sakura dorayaki cakes and sakura sembei rice crackers crackers. Read the full text of my sakura snack article at Soshiok. I used to take the organic label with a grain of salt. About a decade ago, when I was teaching English at the late, unlamented Nova chain of language schools, I had the following dialogue with an advanced student who identified himself as an organic spinach farmer. Teacher: What does it mean to be an “organic” farmer? Student: I grow my crops naturally, without fertilizers. Student (chuckling at Teacher’s naivete): Of course I use pesticides. However, that was then and this is now. I have since learned that even as my student and I were having that strange dialogue, Japan’s agriculture ministry was implementing Japan Agricultural Standards (JAS) rules for labeling organic foods. The section on “Controlling noxious animals and plants” (aka pests) does permit the use of some “agricultural chemicals,” but only as a last resort when the crop is in danger and nonchemical measures have failed. So, at the very least, foods labeled as “organic” in Japan are less likely than other foods to have been produced with undesirable chemicals. But I am only a mildly ideological eater, and what really impressed me about the food at Keke was how good it all was. There were only two Keke branches at that time, but now they are scattered across the Tokyo area, in locations including Ginza, Yokohama and even Haneda Airport . Moreover, Keke is not alone. At least two more organic buffet chains, Harvest and Nonobudo, have opened many new branches in recent years. The past decade also saw a shopping mall construction boom in Japan (although the current recession seems to have put the brakes on that), thanks in part to a relaxation of the Large Retail Stores Law. Many new malls have opened in suburban areas, where families with kids are common, and many of those malls contain veggie-rich buffet restaurants (which may or may not make organic claims) where families like to go. If you want to get your kids to eat their vegetables, turning them loose on a buffet that has 20 choices is probably a good way to make sure they find something they like. The center square is occupied by boiled konnyaku with a miso-based sauce. Konnyaku is a rubbery, mostly flavorless substance sometimes described in English as devil’s tongue jelly after the plant from whose large, lumpy corm (or tuber) it is made. 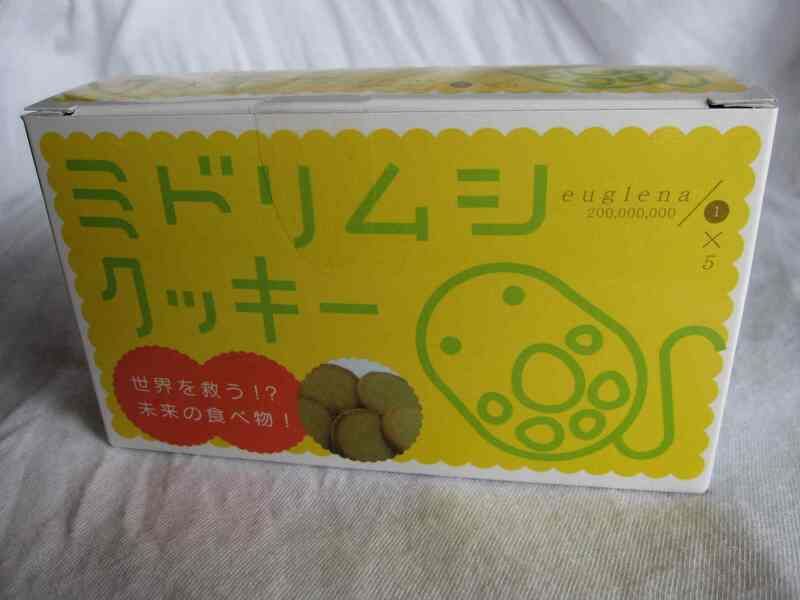 Because it is reputedly high in fiber and low in calories, it is popular among dieters in Japan. But its lack of taste means that it must be served with some kind of sauce or flavoring, and there, one suspects, an calorie or two might creep in. 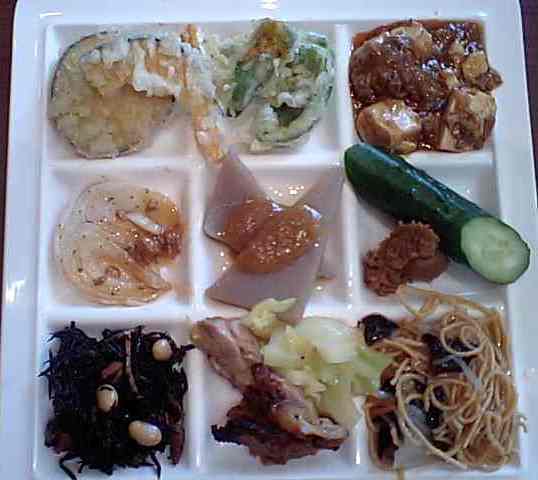 The rest of the plate is occupied by, clockwise from top left, mixed vegetable tempura sprinkled with curry-flavored salt, mapo tofu, a fresh cucumber with miso paste to dip it in, a fried noodle dish called katayakisoba, miso-glazed chicken with cabbage, hijiki seaweed with beans, and a grilled onion slice with meat sauce. 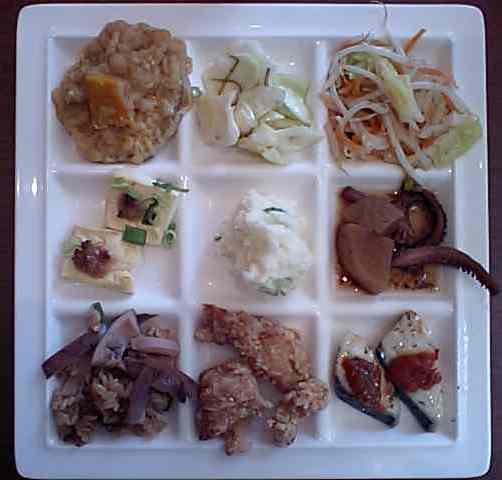 All of this was fairly tasty, but the katayakisoba suffered from being served on a buffet. Ideally, the gloppy, vegetable-laden sauce (with kikurage tree-ear mushrooms a star ingredient) should be ladled over the crisp, dry noodles just before they are served. When everything is left together on the buffet, the noodles get soggy. The mapo tofu was a more pleasant surprise. This is usually a spicy dish, but at a shopping-mall buffet one might reasonably expect the spice to be dialed down to the mild end of the scale to appeal to the lowest common denominator among general public palates. But at Hinano, the flavor was unexpectedly (and laudably) fiery. With potato salad in the center, the other dishes clockwise from top left are: a fried sweet potato simmered in tomato and fish soup, crunchy sesame-flavored cabbage with strips of kombu, bean sprouts and other vegetables sautéed in “Mongolian salt,” stewed daikon radish and squid legs, baked sawara (Spanish mackerel) with tomato sauce, fried chicken, squid pilaf and baked tofu. In a post earlier today, I reflected on Chris Anderson’s description in his book “Free” of why Wikipedia has been such a successful method of gathering and distributing content for free. But there are less legitimate ways to distribute content at little or no cost, including piracy and plagiarism. “Free” discusses one of these options, and seems to practice the other. There is some truth to this. But the full truth is that the hard-working artists have made the best of a bad situation and managed to eke some advantage out of the wrongdoing of the pirates. This incidental benefit does not make the pirates’ actions any less wrong. Pirates are thieves. In his enthusiasm for the “free economy,” Anderson breezes over this central moral issue. A more troubling moral issue, which has spoiled my enthusiasm for this book, is plagiarism. Waldo Jaquith, Web Editor for The Virginia Quarterly Review, wrote an official VQR blog post in which he alleges that the book contains least “several dozen suspect passages” that seem to have been copied from other sources, without attribution. (Ironically, Wikipedia was prominent among those sources.) He then goes on to illustrate seven of them, placing Anderson’s text and the apparent source side by side, with the identical words highlighted. It’s pretty damning. This is no excuse, and it just barely qualifies as an explanation. One of my pet peeves is the current tendency for nonfiction books to be printed without footnotes or endnotes. (Just as annoying are hopelessly vague ones, along the lines of “Material in this chapter came from the following 20 sources.” Which material goes with which sources?) When I do read a book that has no notes, I tend to assume that when the author doesn’t cite someone else within the text, it means that the author himself is speaking. I’m kind of old-fashioned that way. At worst, Anderson committed a writing sin that may have been made easier by the “Free”-era mentality that intellectual property belongs to everyone and no one, and that it’s no big deal to stamp your own name on it. At best, he tripped himself up by indulging in a no-note trend that needs to be resisted. I had an epiphany recently while reading Chris Anderson’s book “Free: The Future of a Radical Price.” Anderson, who also wrote “The Long Tail,” basically argues that digital technology makes it possible to produce and distribute a million copies something as cheaply as a dozen copies, and that businesses should therefore give away a lot of stuff for free in the expectation that it will pay off if they can turn even a few of the free recipients into paying customers. My own experience seemed to prove what those old economists were saying when I first set foot in Japan back in 1989. I was part of the then-new JET Program, which at the time employed 2,000 young university graduates from six English-speaking countries to help teach their native language at middle and high schools scattered all over Japan. My own assignment was in Chiba Prefecture, which I found to be a lovely and fascinating place. (I’ll explain why in future entries.) Despite all that Chiba had to offer, and even though it was just a stone’s throw outside of Tokyo, there was virtually no information on my prefecture in any of the English-language guidebooks that I owned. It seemed obvious to me that someone needed to write a better guidebook to Japan. I couldn’t cover all of Japan myself, but we JETs had a nationwide support organization called AJET that seemed like the perfect framework within which to produce a quality book. After all, there were 2,000 university-educated members spread all over the islands, including some out-of-the-way places that no guidebook author had ever heard of. I wrote an announcement for the AJET national newsletter (which was printed on paper in those olden days, and cost a full postage stamp for every copy that went out) soliciting contributions and offering to do all the compiling and editing work myself. No one would get paid, but perhaps AJET would financially benefit down the road (it had a lot of paper and stamps to buy), and we would all enjoy the glory of a book credit on our resumes. From 2,000 members, I received about 20 replies. Nineteen of those could be summarized as: “Sounds like it’s going to be a great book! Let me know when I can get a copy!” Only one person made a meaningful contribution, and I had to write a regretful letter telling her that the project was off. Score a point for the pessimistic old economists. So why does Wikipedia work today when my guidebook project failed 20 years ago? It’s mainly because Wikipedia does not rely on paper and stamps. It hit me that what this means in regard to the guidebook project is that if I had been drawing on a pool of 2 million people instead of 2,000, then I would have received 20,000 replies instead of 20. And even though 19,000 of those would still have been editorially useless, the remaining 1,000 would have provided material that I actually could have worked with. The book would exist today. (Or maybe it would be a website.) To top it off, those 19,000 who didn’t contribute but were clearly interested would have been the nucleus from which to grow an audience – hopefully a paying one. But there’s the rub. No one pays to use Wikipedia, which must rely on donations to survive. But then again, survive it does. How commonly this pattern can be replicated remains to be seen, but as Anderson acknowledges once or twice, the “Free” economy is still a work in progress. You are currently browsing the Tokyo Tom Baker: The Blog blog archives for March, 2010.